Handblown Recycled Glass Six Striped Blue Wine Glasses, "Cobalt Spirals"
Swirls of cobalt blue spin unrestrained lending their grace to embellish these wine glasses by Javier and Efrén. A testimony to Mexico's blown glass tradition, the design glows with contemporary chic. Each: 16.5 cm H x 9.7 cm Diam. Each: 6.5" H x 3.8" Diam. 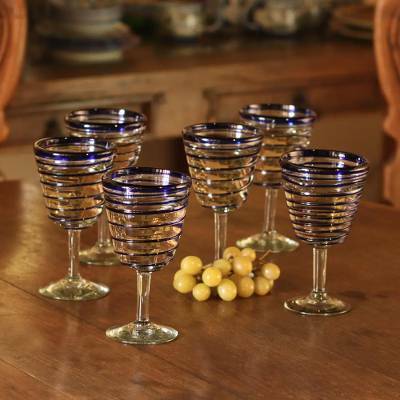 You can find wine glasses 'Cobalt Spirals' (set of 6) by Javier and Efren in tableware categories such as Backyard Barbeque Drinkware, Beach Cottage Drinkware, Eco-Friendly Drinkware, Handblown Drinkware, Glass Drinkware, Cocktail Glasses Drinkware and Wine Glasses Drinkware. Enjoy exploring these sections for other Novica treasures.